I almost feel like I'm cheating. Aren't gluten free cookies supposed to be gritty and dry? Aren't they supposed to be loaded with all kinds of crazy flours? Is this kind of simplicity even allowed? Well it's allowed in my world, because here I make all the rules. 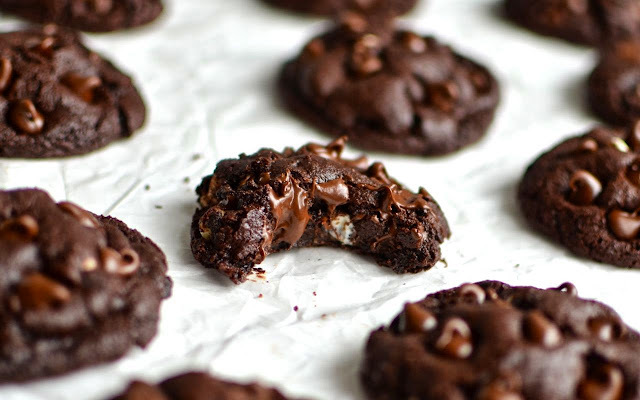 If I say gluten free cookies can be chewy, gooey, and easy, then they can be. If I say that you you have all the ingredients already in your pantry, then you do. And if I say "let there be chocolate", there will be chocolate. Preheat oven to 350ºF. Mix together the butter and sugars. Add the egg and vanilla and mix until combined. Mix together the soda, salt, and cocoa and add to the wet ingredients, mixing until combined. Stir in the chocolate chips and nuts. Bake for about 10 minutes or until they look done. *I haven't tried coconut oil, but it should work. Heh. Love this concept & the cookies look yummy! Definitely trying this. These cookies looked so good and without flour. Thought I would give the recipe a try and make them. They did not turn out as some of the other comments stated. I did not make the whole batch at start. I added some gluten free flour to the mix and tried again. They turned out with the flour. I do not think I will make again. They are very sweet. I feel the sugar could be decreased down. I have made them many times and never had a problem. I'm not sure what could have happened but I am so sorry they didn't work for you. They're AMAZING. 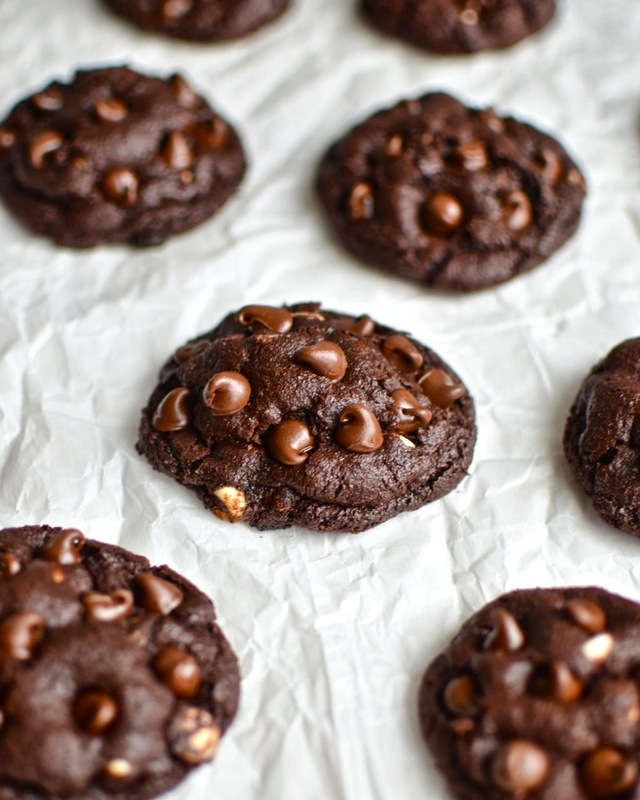 They're our absolute favorite homemade cookie! Even my non-gf guys love them. My mouth is watering thinking about them. I know what I'm making tomorrow! i'm going to die from cookie overload. i've only eaten two (plus probably 3 in dough form) and i am in love. thank you!! These are amazing! I made them with one cup butterscotch chips instead of the semi sweet and white. They were absolutely delicious not to mention quick and easy to make. This a one for the recipe book! I made these tonight and they are CRAZY good. Man, they are going to be gone quick! Can anyone shed some light on what I did wrong? I mixed up these cookies per instructions, and after 8 minutes, they were completely flattened, uncooked piles of gooey chocolate sugar and butter. Where did I go wrong? Try chilling the dough before you bake the cookies. If the butter gets to melty, that will happen to any cookie recipe. If you melted the butter before mixing, that could be why. Just chill the dough for maybe 30 minutes before baking and that will solve the problem. I had this problem too. I refrigerated it for 45 mins and they still turned out as puddles. I had to throw them all away! I did use soy butter and flaxseed egg. I found that they took closer to 12 minutes to bake. I'm surprised that they were flattened, though--my dough was so thick that I had a hard time stirring it to get the chips in. Your baking soda is probably expired. Buy fresh and try again! My cookies did the exact same thing! I don't know what I did wrong! I followed the recipe to a tee! I just wish I knew how to fix them. I followed the recipe exactly, plus I refrigerated why batter, but they flattened out and went crispy and burntish. So I tried adding some coconut flour and a little bit more butter, and then they turned out soft and rich-delicious! 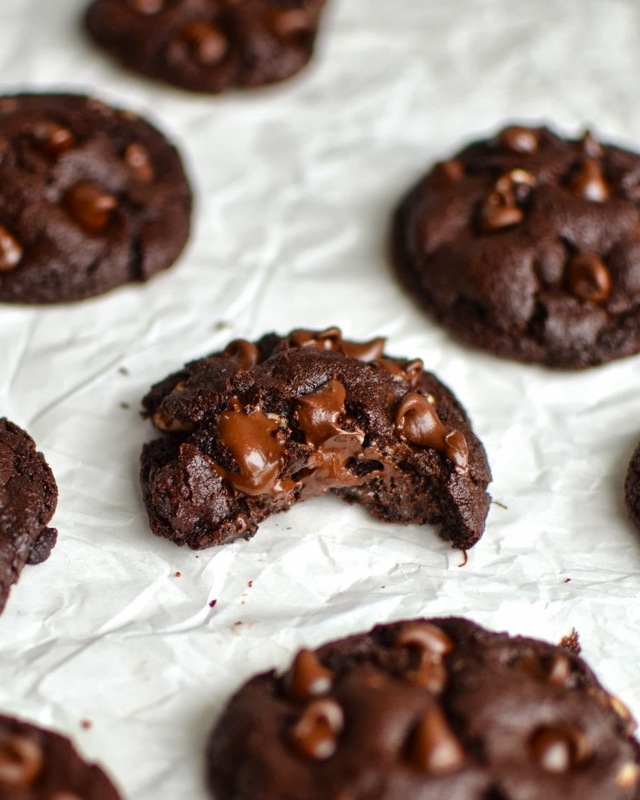 Brownies + cookies = the best chocolatey treat ever! I like that it's just cocoa powder and no other GF flours. i would love to try these. can i use agave nectar rather than the brown and white sugar? I just made a batch of these and they are fantastic. Soooo chocolatey! I have made 4 of your GF recipes now and they were all really yummy. Can't wait to try more. These look fantastic - can't wait to try them out this weekend! Yum. I'll bet using peanut butter chips would make them like peanut butter cups. Wow, the possibilities are endless. THANK YOU. these are the best things ever. i have made 3 batches in a week for people. 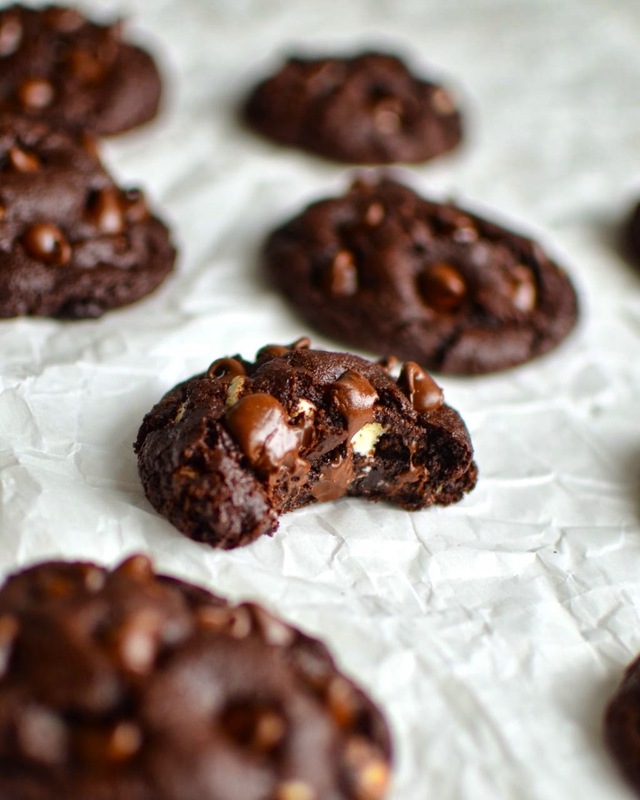 with mint chocolate chips. thanks! Heather, I did the same as your, coconut oil and coconut sugar instead of white sugar. I also used a flax egg replacement. Mine were oily and very thin I did not chill, was that maybe the problem do you think? I refrigerated them for about a half an hour before baking and they barely spread out! I just made these and even my anti-gluten free brother-in-law said they were delicious. And I quote: "This is the best gluten free thing I've ever eaten!" I definitely suggest refrigerating for 10-20 minutes before baking, but otherwise followed the recipe exactly as listed. YUM! Hi. What do u mean by mixing? Using the mixer issit? Or just a spatula? Tx. is the brown sugar packed or unpacked? Mine turned out weirdly salty? Was I supposed to use unsalted butter? Tried this last night, they came out great! 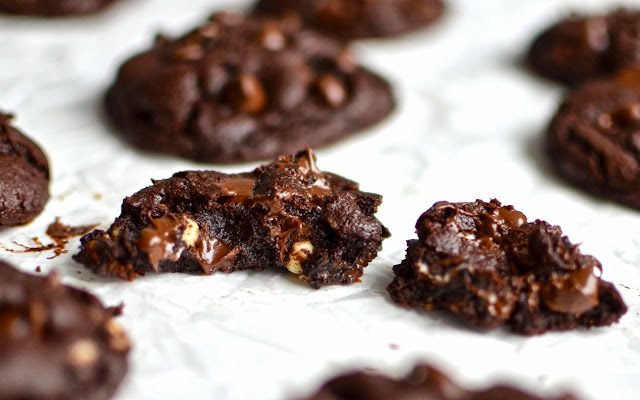 Delicate and crispy with a rich dark chocolate flavor. My boyfriend calls them "Charklates" lol. Used margarine instead of unsalted butter, and am wondering if they maybe would have been chewier? Today they're still good but quite crispy and crumbly. Really really yummy! Just wanted to add...if you are making these for someone who is gluten-free, make sure your vanilla and chocolate chips are gluten free. Do you use sweetened or unsweetened cocoa powder? These were decadent! Loved them, couldn't eat more than two in one sitting. I love these cookies!!! My mother-in-law found the recipe a few Christmases ago and this is the first holiday season I've tried to make them myself. Was able to find all the right ingredients in London and even with an English oven they turned out fabulous! I read the comments and was scared they'd end up as gooey piles, so I popped the dough in the fridge for a couple minutes before spooning onto the baking sheet. Also yielded more than 12 cookies. These are my favorite, thank you for sharing the recipe! I made these using coconut oil! They're incredibly rich with a nice chewy/soft/melt-in-your-mouth texture and I love them. Beware 1 -- the coconut oil leaves an oily feeling on your lips/fingers, but isn't overpowering in the actual cookie taste and texture! I would use coconut oil over butter again.